Macular degeneration is a disease of the eye which can affect the patient’s field of vision. There is a strong link with aging with some ten percent of people over 65 being affected to a greater or lesser extent. The disease is, therefore, often referred to as age-related macular degeneration or AMD. The macula is located at the back of the eye in the area known as the retina. It is a small area, normally no more than 5.5mm in diameter. Along with the rest of the retina the macula has a structure comprising a high concentration of photoreceptor cells. Within the retina the two principal photoreceptor cell types are rods and cones. The surface of the macula is covered by cone cells and this area is vital to our fine vision, colour perception and the centre of our field of vision. What is Macular Degeneration? The inside of the human eye comprises three layers, the innermost being the retina. Within the retina are a myriad of photoreceptor cells which convert light into an electrical signal which the brain can access and interpret. At the centre of the retina is the macula and, as discussed above, this area is crucial for converting light into high resolution colour images within the brain. The macula also allows us to perceive the central area of our field of vision, whereas other parts of the retina are responsible for our peripheral vision. The onset of macular degeneration is marked by the gradual accumulation of cellular debris within the retina. The medical term for these cells is drusen. The drusen cells are characterised by a yellow or white hue and, should a significant number of them be deposited upon the cones of the macula, the person’s visual acuity will begin to be affected. This condition is known as ‘dry’ macular degeneration. A less-common condition referred to as ‘wet’ macular degeneration affects some ten percent of AMD patients. This occurs when the initial occurrence of macular degeneration stimulates the growth of new choroidal blood vessels in the retina. Although this response seems to be the patient’s body’s attempt to heal the damage caused by dry macular degeneration, the new blood vessels actually worsen the deterioration in vision. Loss of visual acuity; where the patient finds it difficult to see the fine detail of objects within their field of vision Loss of contrast sensitivity; meaning that the patient sometimes finds it difficult to distinguish between an object before them and its background Distortion of central vision; although the patient’s peripheral vision remains unaffected. Those affected by AMD typically become aware of it when they begin to experience difficulty with everyday tasks such as reading and watching television. At first patients may assume it is their existing long or short-sightedness becoming worse but, sooner or later, the patient will begin to realise that the new symptoms are possibly something different. AMD is most typically a disease of those over-65. However, it can sometimes affect people in their 40s or 50s. Dry AMD, as previously indicated, is the most common form of macular degeneration and affects some ninety percent of patients with AMD conditions. It is characterised by an erosion of the RPE (retinal pigment epithelial) cells on the surface of the macula. The process of these cells eroding is called atrophy, hence dry AMD sometimes being referred to by medical practitioners as atrophic AMD. Intermediate AMD – by the intermediate stage larger deposits of drusen form and the macula will begin to be affected. It is likely that the patient’s central vision will begin to deteriorate and Advanced AMD – at this stage there will be substantial damage to the macula and the patient will be experiencing a range of symptoms. Wet AMD is an advanced form of macular degeneration. In most cases it develops from dry AMD. As noted earlier, wet AMD is caused by the eye developing new blood vessels in response to the onset of macular degeneration. These blood vessels, known as choroidal neovascular membranes, have a tendency to leak and form lesions. The result is extremely detrimental to the retina and, in particular, to the macula. It is not yet clear why around one in ten dry AMD patients go on to develop wet AMD. However, early detection is vital to identify the need for treatment to prevent the further deterioration of the patient’s vision. Overall, the most compelling factor indicating the onset of wet AMD is the rapidity of the spread and severity of the patient’s symptoms. There is no definitive answer to the question of what causes macular degeneration. However, the principal factor involved in its onset is age: up to forty percent of those aged over seventy-five are affected. As an inevitable consequence of the aging process, the tissue in one’s macula begins to deteriorate. The extent to which each of us is affected varies from one individual to another in accordance with a number of other risk factors. Eye colour* – The higher prevalence of AMD in those with light-coloured eyes, as opposed to people with darker eyes, suggests a further genetic link. High blood pressure – people who develop high blood pressure and/or heart disease increase their risk of developing AMD. People who are experiencing some of the symptoms of AMD and are concerned that they may have the disease should speak to their GP at the earliest opportunity. If the GP thinks a further investigation is necessary he or she will refer you to a specialist practitioner known as an ophthalmologist. Indications of AMD can be diagnosed by a routine eye examination; typically by the presence of drusen in the retina. The ophthalmologist will begin by asking you for details of the symptoms you are experiencing, your general health and your medical history. Fluorescein Angiography – this examination creates images of the blood vessels within your eye and the flow of blood within them. Optical Coherence Tomography (OCT) – this process involves scanning the retina with near-infrared light. Microperimetry – some ophthalmologists will use microperimetry to measure the structure and functioning of your retina. This painless procedure involves projecting a spot of light into different parts of your eye. Currently there is no cure for either form of age-related macular degeneration (AMD). However, there are steps you and your doctor can take to improve your eye health, slow-down the progression of the disease and maximise the effectiveness of your existing vision. Treatments for Dry AMD With dry AMD the deterioration in your vision occurs very slowly and never reaches the point where you lose your vision completely. In addition, your peripheral vision remains unaffected. There are ways of managing the condition to ensure that you can carry on doing everyday tasks, such as reading and writing, and to help you maintain a good quality of life. In most parts of the country your doctor can refer you to a local low-vision clinic where specialist advice is available to help you find ways of continuing with most of your usual activities. Research information is emerging that suggests a diet rich in certain vitamins and minerals can slow the progression of dry AMD and, to a degree, stave off the onset of wet AMD. Lutein, zeaxanthin and vitamins A (beta-carotene), C and E are all thought to be beneficial in this regard. Whilst the evidence is far from conclusive, a balanced diet rich in fresh fruit and vegetables will in any case be beneficial for your all-round good health. Your ophthalmologist can advise on whether this option might be suitable for you. Carrots, tomatoes, leafy green vegetables, oranges and kiwi all contain high levels of A, C and E vitamins. Mangoes, peas, sweetcorn and leafy green vegetables all contain good levels of lutein. Anti-VEGF medication is a treatment which slows the progression of wet AMD by preventing the uncontrolled growth of new blood vessels in the retina. VEGF is an abbreviation for the process known as 'vascular endothelial growth factor'. VEGF promotes the growth of new blood vessels in the eye as a natural response to the onset of wet AMD. Anti-VEGF drugs contain a chemical which will block this response and prevent the new vessels from developing. The medication’s purpose is to stop your vision deteriorating any further. In a smaller number of cases patients actually experience some improvement in their vision, though a complete reversal of the deterioration is unfortunately not an option. Anti-VEGF medication is injected into the eye with an extremely fine needle under local anaesthetic. The anaesthetic is applied as a droplet to ensure that the whole procedure is painless and most patients report that any discomfort is only minimal. Both drugs, however, have a number of side-effects which, although relatively minor in most cases, you should talk over with your doctor before proceeding. 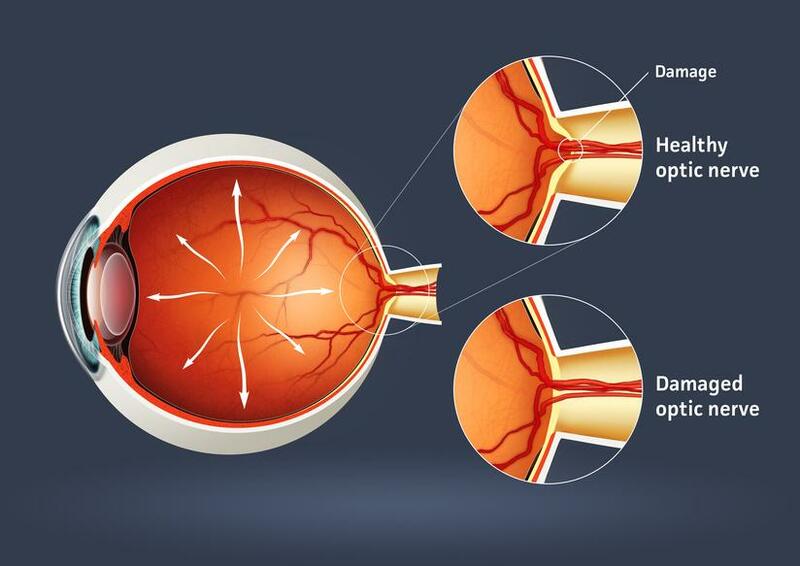 the part of your eye which the AMD appears to affect is no more than twelve times the size of the point in your eye where your retina is connected to the optic nerver and there are indications your AMD has been getting worse. The UK brand name for ranibizumab is Lucentis. Of the patients for whom it is prescribed, around ninety percent find that it slows down the progression of their wet AMD. Some thirty percent actually experience an improvement in their visual acuity. The course of treatment with ranibizumab involves an initial ‘maintenance’ phase where the drug is injected into the affected eye once a month for three months. The effectiveness of the treatment is then assessed before deciding whether or not the patient would benefit from continuing the injections. Aflibercept is a more recent anti-VEGF drug. Its brand name in the UK is Eylea. Studies show aflibercept is at least as effective as ranibizumab, but it has the advantage of generally needing injections and review appointments at less frequent intervals than the older drug. Both drugs, as indicated earlier, can have side-effects. The most common are inflammation and irritation in the eye, minor bleeding and increased pressure within the eye. Provided your visual acuity has not deteriorated to too great a degree, photodynamic therapy (PDT) may be recommended. For this treatment to be effective you need to have visual acuity of at least 6/60, which means you can see at six metres objects that those with normal vision can see at sixty metres. PDT is suitable for some twenty percent of wet AMD patients. The procedure involves having a photo-sensitive drug called verteporfin injected into your arm. The drug circulates in your blood-stream and some of it attaches to the damaged vessels in your macula. The ophthalmologist then shines a low-powered laser into your damaged eye for a short time. The light activates the verteporfin causing it to destroy the damaged blood vessels thus preventing bleeds and leakages which would damage your macula. The process may need to be repeated every few months as new damaged blood vessels will continue to develop. Laser photocoagulation only tends to be used in the small number of cases where Anti-VEGF medication and PDT are not appropriate. It is also unsuitable for wet AMD patients whose damaged blood vessels are too close to the fovea, as laser surgery in this area could put the patient’s vision at risk of irreparable damage. In this procedure areas of the retina are burned so that the tissue hardens and prevents new blood vessels forming. This can arrest or slow the development of wet AMD, but the process carries with it a number of side effects. The principal consequence is that you will be left with a permanent grey or black smudge in part of your field of vision. But in most cases where other treatments cannot be used the side effects of laser photocoagulation are less severe than the symptoms of uncontrolled wet AMD. There are ongoing clinical trials of the effectiveness of using radiotherapy in conjunction with anti-VEGF medication. The early indications are encouraging with suggestions that the use of radiotherapy may reduce the number of anti-VEGF injections required. Your ophthalmologist will discuss with you whether or not this new form of treatment is suitable for you. Lens implantation - in lens implantation the effects of AMD are reversed by removing the lens from your eye and replacing it with an artificial one. When someone develops macular degeneration there are a number of consequences and complications that impact upon his or her life. It is important for both the patient and his or her family and carers to be offered appropriate information and support. Coming to terms with a condition that potentially affects your independence and your ability to do ordinary tasks is naturally very difficult. It can be frightening and can undermine your confidence and self-esteem. Some thirty percent of AMD patients experience some degree of anxiety and/or depression. But help is available: your doctor can put you in touch with people with whom you can talk through your fears and help with strategies and adaptations to continue doing everyday tasks. Central vision is crucial to your ability to drive a car safely. Unfortunately, some AMD patients find that the DVLA has to withdraw their driving licence on medical grounds, which has major implications for their mobility and independence. However, many AMD patients whose symptoms are only moderate are allowed to continue to drive. You may, however, be required to have a vision test in order to confirm your suitability for driving. Around ten percent of people with AMD experience some form of visual hallucination during the course of their illness. Although this is a normal response of the human brain to the changes in the eye’s ability to see caused by AMD, most people still find it disturbing and some patients worry that they may even be experiencing a mental illness. Your doctor can reassure you and advise you about coping strategies. The hallucinations are not a permanent phenomenon; most people find that this phase of their AMD lasts no longer than eighteen months. In addition to the treatment options described above, people who are living with the effects of macular degeneration may find that they benefit from one or more of the many low vision aids that are now on the market. The purpose of a low vision aid is to help you make the most of your vision so that you can engage in everyday tasks a little more easily. ‘Low vision’ refers to eye sight problems that cannot be corrected by glasses or contact lenses. Some two million people in the UK are classed as having low vision. Many of them have AMD, but the group also includes people with cataracts and diabetic retinopathy. Electronic low vision devices – electronic low vision devices combine a camera to magnify an object and screen for the user to work with the magnified image. Aural devices – these include devices that emit a ‘beep’ when a kettle or other container is filled with liquid to its optimum level. Most of us who visit bookshops or public libraries will be aware of the wide range of large print books that are available. Low vision users can also access large print versions of public sector and utility company forms and leaflets, as well as a whole raft of other written material. Age-related macular degeneration is a growing concern. As a society, we are all living longer and the health concerns related to age, such as AMD, are increasingly coming to the fore. But help is available. As yet there is no cure for AMD. However, as we have discussed in this piece, the medical profession has a number of treatments available to slow down the advance of macular degeneration. Strategies and devices are also widely available so that, should you be affected by AMD, low vision assistive devices can help you make the most of your vision and allow you to carry on with the everyday activities you have always enjoyed. Age-related macular degeneration (AMD) - This page provides information on the eye condition age-related macular degeneration. Macular Society: Support throughout central vision loss - What is the macula? Scientific American - What causes macular degeneration in the eyes? Have there been any advances in curing this condition? AMD Macular Degeneration Partnership - Understanding Dry Age Related Macular Degeneration Symptoms. NHS Choices - Macular degeneration - Diagnosing macular degeneration. Mayo Clinic - Diseases and Conditions - Wet macular degeneration. Mayo Clinic - Diseases and Conditions - Wet macular degeneration Symptoms. Mayo Clinic - Diseases and Conditions - Dry macular degeneration Causes. Bright Focus Foundation - Macular Degeneration Prevention & Risk Factors. WebMD - Macular Degeneration Health Center - Age-Related Macular Degeneration Diagnosis & Tests. NHS Choices - Macular degeneration Treatment - Treating macular degeneration. Health line - Foods That Pack a Nutritious Punch: Vitamins A-K.
What is Lucentis® (ranibizumab injection) | How Lucentis May Work - LUCENTIS® (ranibizumab injection) is a prescription medicine that you may receive from your Retina Specialist. It was approved by the FDA in 2006. Macmillan Cancer Support - Photodynamic therapy (PDT) - Cancer Information. NHS Choices - Macular degeneration Complications - Complications of macular degeneration. Macular Society - Low Vision Aids - Support throughout central vision loss.